Want to know more about the environment and terrain of the Larapinta Trail? 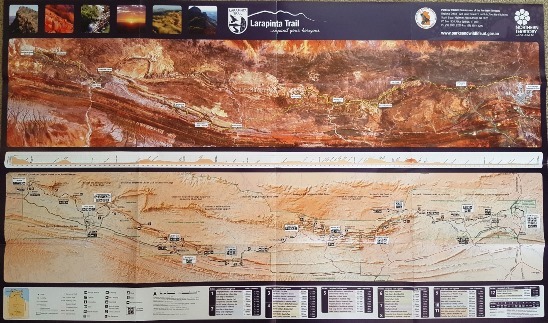 The new updated 4th edition Larapinta Trail map packages are now available for purchase. Providing an insight into the flora, fauna, culture, history, geology and terrain, the Larapinta Trail Map Package is a great resource both for the independent and guided tour walker on the trail. • Poster sized map of the entire trail. • 12 section contour maps with trail notes on rip-proof/water-proof paper, stored in a plastic pocket. • Please email us at info@trektoursaustralia.com.au. • Call us on 1300 133 278. • Visa/MasterCard (2% surcharge) and American Express (2% surcharge).